To beat the back-to-school rush, the health department will be offering low-cost immunizations by appointment at the Public Health Clinic at 650 Newtown Pike. To schedule an appointment or for more information about the immunizations, please call (859) 288-2483. 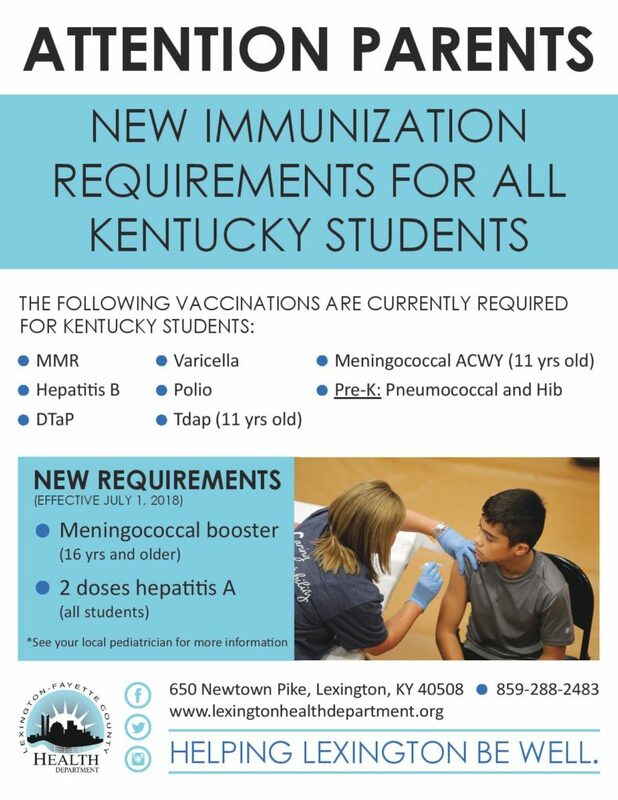 Fayette County students who are new to the school district or are entering kindergarten are required to bring a Kentucky immunization certificate in order to enroll. Sixth-grade students are also required to have certain boosters and must bring an up-to-date immunization certificate. Please call the health department’s school health division at (859) 288-2314 for more information. New requirements: 2 doses hepatitis A (all students) and meningococcal booster (16 years and older). Stay safe during summer heat! Drink plenty of fluids. You will need to drink more fluids than your thirst level indicates. Avoid drinking alcoholic beverages or drinks with large amounts of sugar because they cause you to lose more fluid. Wear sunscreen and appropriate clothing. Sunscreen should be SPF 15 or greater and applied 30 minutes before going outdoors. Choose lightweight, light-colored, loose-fitting clothing. Wear a wide-brimmed hat that will provide shade and keep your head cool. Schedule outdoor activities carefully. If you must be outside, try to plan your activities so that you are outdoors either before noon or in the evening. Stay indoors and, if at all possible, stay in an air-conditioned place. If your home does not have air conditioning, go to the shopping mall or public library. Even a few hours spent in air conditioning can help your body stay cooler when you go back into the heat. Use a buddy system. When working in the heat, monitor the condition of your co-workers and have someone do the same for you. Monitor those at high risk, including infants and children up to 4 years of age, people 65 and older, people who are overweight, people who overexert during work or exercise and people who are ill or on certain medications for blood pressure diuretics. Visit adults at risk at least twice a day and closely watch them for signs of heat exhaustion or heat stroke. Infants and young children need much more frequent watching. Signs of heat-related illnesses include an extremely high body temperature (above 103°F); red, hot and dry skin (no sweating); rapid, strong pulse; throbbing headache; dizziness; nausea; confusion; muscle cramps; tiredness and unconsciousness. If someone starts to experience these symptoms, seek medical help immediately and move them to a shady spot, if outdoors, and begin cooling them using whatever methods are available. Monitor body temperature, and continue cooling efforts until the body temperature drops to 101-102°F. 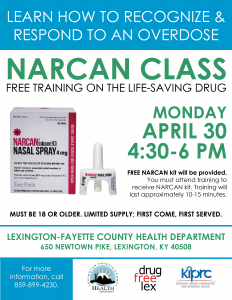 The Lexington-Fayette County Health Department is hosting a free community training on naloxone, which will include providing free kits containing the overdose-reversing medication. The class is scheduled for 4:30-6 p.m. Monday, April 30 at the health department’s main building, 650 Newtown Pike. Participants must complete a 10-15-minute training to receive a free naloxone kit. The kits are only available to those 18 years of age and older; a photo ID is required. A limited number of Narcan kits will be available, so it will be on a first-come, first-served basis, with four sessions of up to 50 people per class for a total of 200 kits. The health department provided 144 free Narcan kits during a community class in January. 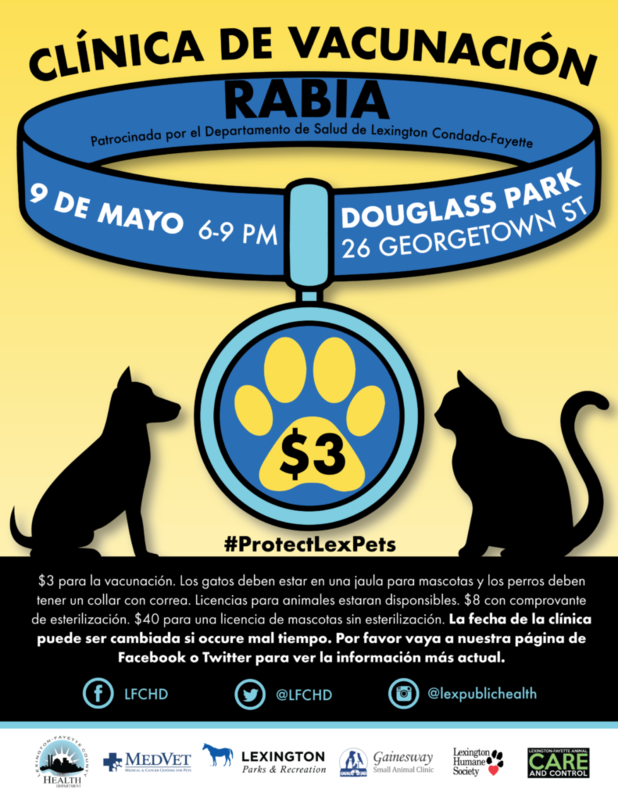 The kits are also available 11 a.m.-1 p.m. Fridays as part of the health department’s needle-exchange in the Dr. Rice C. Leach Community Room at 650 Newtown Pike. The free naloxone kits are available to the community through partnerships between the health department, Drug Free Lex and the Kentucky Injury Prevention and Research Center, part of the University of Kentucky College of Public Health, and a bona fide agent for the Kentucky Department for Public Health. The Lexington Legends announced Tuesday that Whitaker Bank Ballpark will be 100 percent tobacco-free this season! The Lexington-Fayette County Health Department is partnering with the organization to help educate fans on ways to stop tobacco use. Be sure to look for our information on the team’s schedule magnets being given away Opening Weekend at the ballpark! Lexington Mayor Jim Gray also announced that all city-owned ballparks will be 100 percent tobacco-free. Call us at 859-288-2446 to learn more on how we can help you or someone you know quit using tobacco in 2018! The Lexington-Fayette County Health Department’s Board of Health has selected Dr. Svetla Slavova as the 2018 Dr. Rice C. Leach Public Health Hero. The award is given annually to individuals who have demonstrated their dedication to improving the health of Lexington residents. The winner is announced each April as part of National Public Health Week (April 2-8, 2018). Dr. Slavova is an associate professor of Biostatistics at the University of Kentucky College of Public Health, and a faculty member at the Kentucky Injury Prevention and Research Center (KIPRC), a bona fide agent of the Kentucky Department for Public Health, housed within the College. She has served as principal investigator and co-investigator on projects supporting reducing prescription drug abuse in Kentucky and quality improvement in the Kentucky Trauma Registry, among many other important grant-supported investigations. She is widely published on topics related to injury surveillance and public health and safety. Through her work at KIPRC, which combines academic investigation with practical public health initiatives, she has been active in helping Lexington and Kentucky be well for more than a decade. Most recently, Dr. Slavova’s efforts helped the Lexington-Fayette County Health Department offer free naloxone kits as part of its needle-exchange program. Dr. Slavova will be recognized at the April 9 Board of Health meeting held at 5:45 p.m. in Lexington-Fayette County Health Department’s Dr. Rice C. Leach Community Room, 650 Newtown Pike. She will also be honored at the April 12 Lexington-Fayette Urban County Council meeting. Past winners include Reginald Thomas (2017), Dr. Rice C. Leach (2016), Dr. Susan Pollack and Marian F. Guinn (2015), the Rev. Willis Polk and Baby Health Service (2014), Anita Courtney and Teens Against Tobacco Use (2013); Vickie Blevins and Jay McChord (2012); Jill Chenault-Wilson and Dr. Malkanthie McCormick (2011); Dr. Jay Perman (2010); the Lexington Lions Club (2009); Dr. David Stevens and the late Dr. Doane Fischer (2008); Dr. Ellen Hahn, Mary Alice Pratt and Therese Moseley (2007); Dr. Andrew Moore and Rosa Martin (2006); Jan Brucato and Dragana Zaimovic (2005); and Dr. John Michael Moore, Ellen Parks and Lexington-Fayette Urban County Government (2004). Dr. Robert Lam received a Lifetime Achievement Award in 2007. The purchase of Narcan was supported by a grant 2014-PM-BX-0010 (Data-Driven Multidisciplinary Approaches to Reducing Prescription Abuse in Kentucky) awarded by the Bureau of Justice Assistance, U.S. Department of Justice. 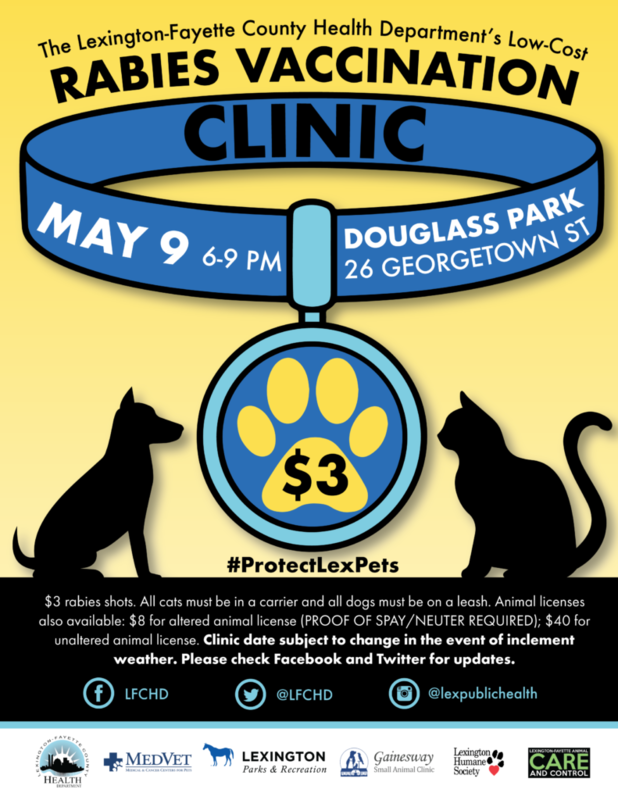 For additional information, like the Lexington-Fayette County Health Department on Facebook at www.facebook.com/LFCHD, or follow us on Twitter at twitter.com/LFCHD and Instagram at @lexpublichealth. Beginning in January, our free HIV testing and counseling hours will change! Get tested Fridays from 8:30 a.m.-12:30 p.m. at 650 Newtown Pike. Testing is free and confidential. For additional information on HIV & Syphilis testing, call (859) 288-2437. The following is a summary of the recent changes, effective June 21, 2017, to 902 KAR 2:060 Immunization schedules for attending child day care centers, certified family child care homes, other licensed facilities which care for children, preschool programs, and public and private primary and secondary schools, http://www.lrc.ky.gov/kar/902/002/060.htm. This amended Kentucky Administrative Regulation requires all children to have a current immunization certificate on file, contains the required immunizations schedule for attending, and has a process to obtain a religious exemption from the required immunizations. Homeschooled children are required to submit a current immunization certificate to participate in any public and private school activities (classroom, extra curriculum activity, or sports). All vaccines administered are printed on the Commonwealth of Kentucky Certificate of Immunization Status now including immunizations not required for school entry. Religious exemptions shall be documented on a signed and notarized Commonwealth of Kentucky Parent or Guardian’s Declination on Religious Grounds to Required Immunizations. There will be a space for the parent or guardian to initial each specific immunization they are choosing to decline. New versions of forms, effective June 21, 2017, can be found on websites for the Kentucky Department of Education, http://education.ky.gov/districts/SHS/Pages/Immunization-Information.aspx. and the Kentucky Immunization Program, http://chfs.ky.gov/dph/epi/Immunization.htm. Out-of-state immunization certificates may be accepted if they meet the same age-specific requirements as outlined in this regulation. A Commonwealth of Kentucky Certificate of Immunization Status printed from the Kentucky Immunization Registry (KYIR) does not require a signature. A licensed practical nurse (LPN) designee of a physician, local health department administrator, or other licensed healthcare facility may sign the Commonwealth of Kentucky Certificate of Immunization Status. School nurses and administrators can enroll in KYIR and print the Commonwealth of Kentucky Certificate of Immunization Status from the registry, and it will not require a signature. Routine certificate reviews are to occur at enrollment in a day care center, kindergarten, seventh grade, eleventh grade, and for the 2018-2019 school year for twelfth grade; new enrollment at any grade; upon legal name change; and at a school required examination pursuant to 702 KAR 1:160. School by a parent or guardian within fourteen (14) days from when the certificate was found to be invalid.